Thank you for believing me, taking my case, helping us out when you didn’t have to, and WINNING! Should I sue my perpetrator? The following is a brief overview of related verdicts and settlements which the law office of SS&F has obtained on behalf of their clients. Please visit our “Bicycle and Pedestrian Accidents” page for advice if you think you have a case. Middle-aged woman riding her bicycle to work in Fremont, California was killed by a tractor-trailer. Her two adult children were compensated for the loss of their mother. David Fulton and David Spini won a three-week trial against UC Santa Cruz. The case involved a UCSC shuttle bus that turned into a bicyclist traveling down a hill in a bike lane at dusk. UCSC contended that the bicyclist could not be seen because it was dark and he was riding without a bike light. After a hard fought three-week trial the jury decided by a vote of eleven to one that the shuttle bus driver made a right turn without using his blinker, which caused him to strike the bicyclist as he came down the hill towards the main entrance to UCSC. The jury came back with a two million dollar award to compensate the bicyclist for the major injuries he suffered in the accident. Settlement for a school teacher who suffered a brain injury while walking with her four year old son when a parent dropping off her child accidentally pressed the accelerator in her car rather than the brake. The car then struck a fence post which in turn struck the client causing her head injury. Settlement for 23 year old who suffered a brain injury when his bicycle collided with a pickup truck in a dark intersection. Utility company failed to maintain the streetlight at the intersection in working condition, thus creating a dangerous condition. 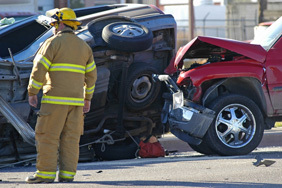 If you have suffered an injury in a vehicle accident or any other type of traumatic event, you may be eligible to receive compensation for the damages you have endured. Liable parties may be required to compensate victims for medical expenses, loss of income, or earning potential, and pain and suffering. Please call our Santa Cruz personal injury law firm at (831) 457-1700 or submit the form below for a free case review if you have been injured due to the negligence of another. There is no charge until we win your case. Instead, call us for a FREE case review. Listen to what our clients say about us. Thank you so much for your hard work and diligence in our personal injury case. The last two years have been difficult for us, but the settlement goes a long way toward making our lives better. We are very grateful." Child Sexual Abuse: Shoul I sue my perpetrator?